The National Hurricane Center defines hurricane season between June 1st and November 30th, with the peak typically from mid-August through late October. It is important to be weather-aware at all times of the year, especially if you live in a coastal location, as tropical systems technically can occur in any month. While the Gulf Coast and Southeastern states are notably well-prepared for tropical systems, the Northeast is no stranger to them as well (Floyd, Irene, and Sandy are some notable mentions). Regardless, do YOU know the difference between a tropical storm or even a hurricane watch and warning? What about the difference between a tropical storm or hurricane? We break it down for you below so that you can be prepared for the any impending storm. First, let's get the definitions between a tropical depression, tropical storm, and a hurricane with its associated categories out of the way. A tropical depression is a tropical cyclone (an organized low pressure system that originates over the tropical oceans) in which the maximum sustained surface wind speed is 38 mph or less. These storms do not receive names, and instead receive a number. A Tropical Depression 2 spinning out in the Gulf. Image courtesy of the Tropical Prediction Center. A tropical storm is a tropical cyclone in which the maximum sustained surface wind speed ranges from 39 to 73 mph. This is the first time a storm receives a name. 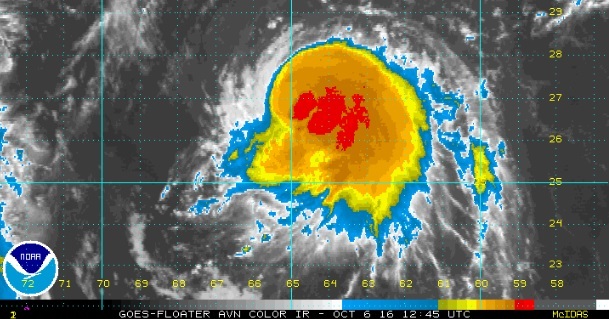 Tropical Storm Nicole as of October 6th. Image courtesy of the National Hurricane Center. A hurricane is a tropical cyclone in which the maximum sustained surface wind is 74 mph or more. The weather community uses the term "hurricane" for tropical cyclones in the Northern Hemisphere east of the International Dateline to the Greenwich Meridian. These systems are called "typhoons" in the Pacific north of the Equator and west of the International Dateline. Hurricanes are often assigned categories based on the Saffir-Simpson Hurricane Wind Scale. These categories range from 1 to 5; see the table below for the type of damage and impacts. 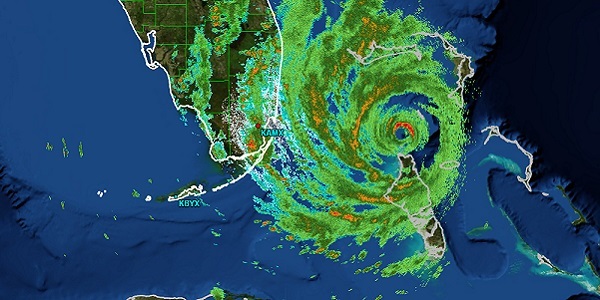 The Saffir-Simpson Hurricane Wind Scale determines the category of a hurricane. The damage ranking above only takes into consideration winds, and does not necessarily take into consideration damage from freshwater flooding, storm surge, or embedded tornadic storms. Table courtesy of the National Hurricane Center. A hurricane is considered a Major Hurricane when it has reached Category 3 status or higher. Hurricane Matthew as of 11 AM on October 6th. At this time, Matthew was a major hurricane, coming in as a Category 4 on the Saffir-Simpson Hurricane Scale. Now that we have established the different types of tropical cyclones and the ranking scale, let's now go into detail about the watches and warnings. Interestingly enough, these watches and warnings can be extended to account for systems that once were tropical but transform into another type of storm after either going over land, cooler waters or interacting with other weather systems. Often times, these types of system become more similar to another powerful low-pressure system common to the Northeast, nor'easters. These other non-tropical systems are often referred to as subtropical (have characteristics of a tropical and non-tropical cyclone), or post-tropical cyclone (a former tropical cyclone, like Sandy in 2012). The National Hurricane Center will continue and maintain tropical watches and warnings even when the system technically is no longer a tropical depression, tropical storm or hurricane since the impacts of the storm are still just as dangerous and the necessary precautions and/or evacuations should be taken, as if it were a tropical system. Tropical Storm Watch: Sustained winds of 39 to 73 mph are possible within the specified watch area with 48 hour in association with a tropical, subtropical, or post-tropical cyclone. Tropical Storm Warning: Sustained winds of 39 to 73 mph are expected somewhere within the specified warning area with 36 hours in association with a tropical, subtropical, or post tropical cyclone. Hurricane Watch: Sustained winds of 74 mph or higher are possible within the specified area in association with a tropical, subtropical, or post-tropical cyclone. Usually, the hurricane watch is issued 48 hours in advance of the anticipated onset of tropical storm force winds, since hurricane preparedness activities become difficult once winds reach tropical storm force. Hurricane Warning: Sustained winds of 74 mph or higher are expected somewhere within the specified area in association with a tropical, subtropical, or post-tropical cyclone. Usually, the hurricane warning is issued 36 hours in advance of the anticipated onset of tropical storm force winds, since hurricane preparedness activities become difficult once winds reach tropical storm force. The warning can remain in effect when dangerously high water or a combination of dangerously high water and waves continue, even though winds may be less than hurricane force. Tropical Storm (blue) and Hurricane (red) Warnings, in addition to Tropical Storm (yellow) Hurricane Watches (pink), for the southeastern United States due to Hurricane Matthew. 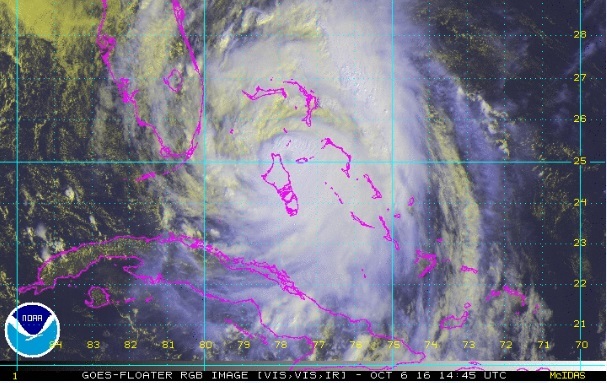 Finally, it is also important to keep in mind that most of the tropical storm and hurricane watches and warnings mainly focus on wind speeds in order to be issued, and not necessarily due to other adverse effects, such as freshwater flooding, flooding rain, storm surge, and tornado-producing storms within the bands of the tropical system. While each of these negative effects have their own watches, warnings, and advisories, they should not be considered less dangerous or less imminent as tropical storm and hurricane watches/warnings. When a devastating storm is bearing down on your neck of the woods, be sure to listen to ALL advisories, watches, and warnings that are issued for your area either by the local National Weather Service office or the National Hurricane Center, and obey evacuation and/or emergency preparedness orders by your local or state governments.